UNITED NATIONS, July 20 -- The UN's job, in Sudan and by extension elsewhere, “is not to police the police,” UN Spokesman Martin Nesirky told the Press on Monday. Inner City Press had asked about reports of torture and crackdown on independent media by the Sudanese National Intelligence and Security Service. But if the UN is spending over $1 billion each on two peacekeeping missions in Sudan, with stated goals including ensuring a fair referendum on the independence of South Sudan and the protection of civilians, shouldn't the UN have been aware of this police activity, including torture? If the UN was aware of it, why did it not speak? Inner City Press: a crackdown on the press. Three newspapers have been closed in Khartoum, and youth, with this Girifna, have been arrested by the Government, all for purportedly supporting separation or the referendum for the south to break away. Does the UN, I heard your statement of Mr. Bassolé, but what does either Mr. [Haile] Menkerios or the UN say about the north-south issue? And it’s related to that or not related to that, are reports that recent killings in Abyei are intended to drive the Dinka people out so that the vote would go Khartoum’s way. Is there any, what’s the UN doing on the north-south front rather than the Darfur front? Associate Spokesperson Farhan Haq: Well, certainly the UN Mission in Sudan (UNMIS) is working very clearly with all the parties trying to ensure calm on the north-south front. I don’t have anything in particular to say about the situation in Abyei right now. As for the crackdown on the press, these allegations we’ll check first and foremost with our Human Rights and UNESCO [United Nations Educational, Scientific and Cultural Organization] colleagues whether they have anything to say on that. But since July 7, nothing has been said on this by the UN, its “Human Rights” (Commission?) or UNESCO. And now on July 19, the UN again said maybe one of its constituent units -- DPKO -- may have something to say. We'll be waiting. Inner City Press asked asked about the Central African Republic government's report that it retook the town of Birao from rebels. The UN's peacekeeping contingent in Birao, 300 strong, “confirmed” the government's retaking. But why didn't the UN, with 300 peacekeepers on site, report the initial attack and take over by rebels? Why didn't the UN's 300 peacekeepers do anything? On July 19, UN Spokesman Martin Nesirky said that DPKO and Ban Ki-moon had made it clear they would prefer from the MINURCAT mission to stay deployed. But when Idriss Deby threw the Chad component out, DPKO did not even try to keep the CAR component in Birao and elsewhere. Nesirky also referred to outgoing top UN humanitarian John Holmes. Inner City Press saw Holmes on Monday leaving the North Lawn building and ran after him to ask: what about Birao? It's a cost - benefit analysis by the UN, without transparency or accountability, and the Central African Republicans, like the Sudanese, are losing. Watch this site. What Would a South Sudan Unilateral Declaration of Independence Trigger, with US Dissing Silent UN? "Total War"
UNITED NATIONS, July 14 -- Less then six months from what is supposed to a referendum on the separation of South Sudan from the rest of Africa's largest country, the UN and others seem under-prepared. Inner City Press also asked about the renewed fighting in Darfur between the government and the Justice and Equality Movement rebels: could the UN confirm it, had it visited the areas or protected civilians? On the latter, the UN could not initially say anything about this fighting in an area it has a $1 billion peacekeeping mission. Later in the day the UN issued a statement in response, that it was “aware of the reports” and would be doing to see. On the helicopter problem, almost nothing was said. This last, some times under the acronym UDI, hearkens to Kosovo, which unilaterally declared independence from Serbia and was immediately recognized by the United States, most but not all European Union countries, and now some 69 of the UN's 192 member states. There, grenades have been thrown, an International Court of Justice case is pending, the UN is in stasis. 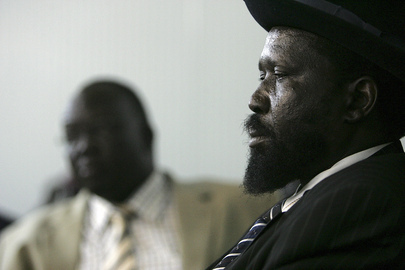 In South Sudan, the diplomat continued, it would be much worse. “Total war,” he called it. Are the UN and member states, the Guarantors referred to in a study out today, prepared or preparing for that? Inner City Press put the question in writing to the US Mission to the UN on July 13, nearly positive it would not be answered. Earlier this month, when Inner City Press asked the US Mission why Scott Gration had not attended a meeting including his Russian, Chinese and EU counterparts in Darfur on July 4, the Mission declined to answer, referring the question to Gration's staffer Marie Nelson, who after three telephone requests also did not answer. Another UN diplomat offered this answer: Sudan is “so important to the US that the US refuses to work with, through or under the UN.” If true, and pending answers from the Obama administration's State Department, what would this mean for the short and long term future of South Sudan? UNITED NATIONS, July 10 -- Why did the U.S. envoy to Sudan, Scott Gration, not attend last weekend's El Fasher summit on Darfur including Gration's Chinese, Russian and EU counterparts? Inner City Press has asked the U.S. Mission to the UN, including Ambassador Susan Rice as she walked into the Security Council. But the question has not been answered. A Rice aide told Inner City Press to ask Gration's spokesperson, Marie Nelson, that she would be waiting for the call. But despite three calls to Ms. Nelson, including a request for answer by voice mail or e-mail, no answer has been received. Nor did a re-request to the U.S. Mission get any answer, except the vague statement that Gration's reason is simpler than it was assumed Inner City Press would speculate. Other press reports have linked Gration's non attendance to his disagreements with the UN's Ibrahim Gambari. 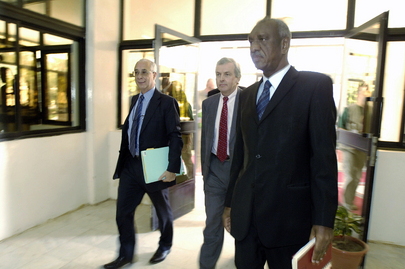 It is not that at this point Gration appears any more committed to justice in Darfur than is Mr. Gambari. It's a turf war, pure and simple. I called Marie Nelson before and after the noon briefing (where I asked some other Sudan questions, including about crackdowns on free press and the youth group Girifna). I'm sending you the "Final Communiqué from JSR Retreat for the Special Envoys to the Sudan" and an article speculating about Gration's absence. They say Gration had agreed to the time and place - true? I'd like an on the record explanation of Gration's non attendance, etc. Three days later, as of this writing, nothing. Watch this site. Inner City Press: On this meeting that you gave a readout of, of Mr. Gambari, you said that various Member States went, but many people picked up on the fact that Scott Gration of the US, neither the UK nor French envoys went. Essentially it was Russian, Chinese envoys; you can give me, if there is a longer list, give it to me. Did Mr. Gambari invite the Western envoys on the Darfur issue, and what does the UN make of their failure to attend and participate? Associate Spokesperson Haq: Well, first off, the full text of the communiqué is available in the Spokesperson’s office. So, you can get a clear view of the parties and the discussions there. It’s, I think, a two-page readout. I don’t know the reasons for attendance or non-attendance of some of these. Inner City Press: hree newspapers have been closed in Khartoum, and youth, with this Girifna, have been arrested by the Government, all for purportedly supporting separation or the referendum for the south to break away. Does the UN, I heard your statement of Mr. Bassolé, but what does either Mr. [Haile] Menkerios or the UN say about the north-south issue? And it’s related to that or not related to that, are reports that recent killings in Abyei are intended to drive the Dinka people out so that the vote would go Khartoum’s way. Is there any, what’s the UN doing on the north-south front rather than the Darfur front? Associate Spokesperson Haq: Well, certainly the UN Mission in Sudan (UNMIS) is working very clearly with all the parties trying to ensure calm on the north-south front. I don’t have anything in particular to say about the situation in Abyei right now. As for the crackdown on the press, these allegations we’ll check first and foremost with our Human Rights and UNESCO [United Nations Educational, Scientific and Cultural Organization] colleagues whether they have anything to say on that. Still waiting on that, too. Watch this site.